Clark+Kensington is a top rated paint by a Leading Consumer Magazine. It’s a paint and primer in one that cuts down on work. With our computer paint matching, it comes in any color you want. 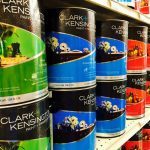 Clark+Kensington also offers ultra stain resistance and a super smooth finish. Our exclusive line of Valspar products includes Valspar Optimus and Valspar Aspire. Valspar Optimus is our best paint with maximum stain resistance, amazing color, and a flawlessly smooth finish. Valspar Aspire is a paint and primer in one offering long lasting color and finish. It’s also a low odor, zero VOC paint for a healthier environment. Ace Royal paint is also a top rated paint by a Leading Consumer Magazine. It remains a time-honored tradition of quality Ace paints. Royal paint provides excellent coverage with a smooth finish. It’s tough on walls, but easy on the wallet.